This is our 25th Annual Organizer! The pocket version “classic” is a 176 page pocket planner (4.25 inches X 5.5 inches) with radical dates for every day of the year, space to write your phone numbers, a contact list of radical groups around the globe, menstrual calendar, info on police repression, extra note pages, plus much more. Choose from 14 cover colors printed with either black or silver ink (depending on how dark the paper stock is – you get to pick the cover color, not the ink color). It has a tough layflat binding and a laminated cover. The large-size version is bound with a super tough tough plasticoil binding (a new feature for 2016) and is twice the size of the “classic” pocket organizer (5.5 inches X 8.5 inches) with twice as much space to write all the events in your life. It is 176 pages. 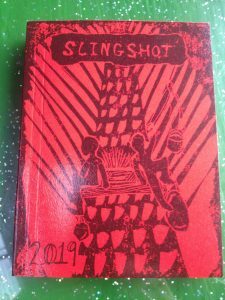 It has similar contents to the classic: radical dates for every day of the year, space to write your phone numbers, a contact list of radical groups around the globe, menstrual calendar, info on police repression, extra note pages, plus much more. You get a little bonus stuff in the spiral version. The spiral version is available in 14 colors printed with either black or silver ink (depending on how dark the paper stock is). The covers are laminated with heavy duty 3 mil glossy plastic to help it survive the year. If you are a distributor, bookstore, infoshop, radical project or otherwise want to order wholesale quantities of the organizer (i.e 20 or more copies), please contact us with your order. If you want less than 20 copies, please contact one of the distributors listed below. If you just want one copy or are a retail buyer, visit your favorite independent bookstore or infoshop or you can order online from one of our distributors. 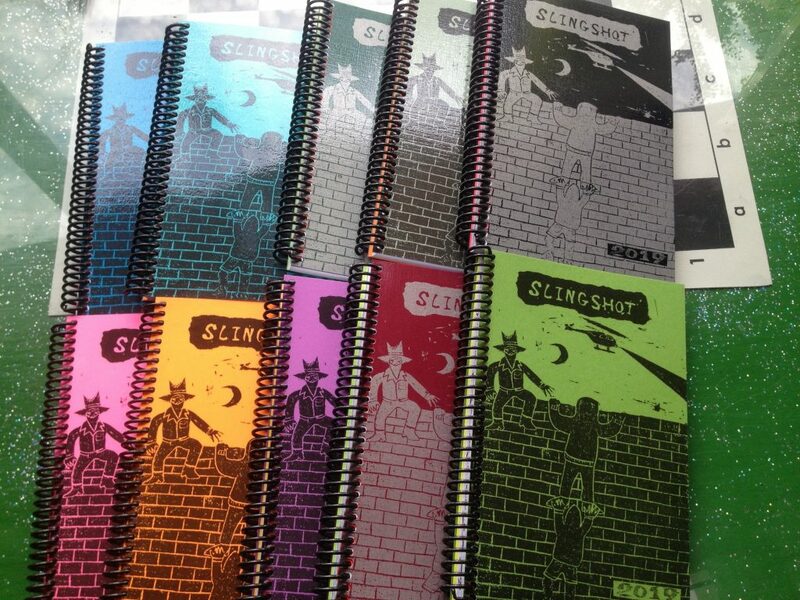 The all-volunteer Slingshot collective is not big enough to be able to handle retail distribution ourselves anymore. Click here for a list of bookstores that carry the Organizer, listed by state. 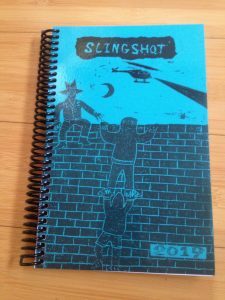 If you live in a small town or rural area that doesn’t have a local, independent bookstore or Infoshop, following are some good mail order projects that carry the Organizer – we love them too and they’re real people too, just not ones you can chat with and end up kissing later on at a party. Slingshot delivers all mail shipments to the post office by bicycle! We are an all-volunteer collective; no one makes profit on this project and all proceeds go to support the struggle for liberation! This year’s organizer is printed on recycled paper. Printed, laminated and bound in the USA and not only that: printed, laminated and bound in the East Bay, California (Berkeley and Hayward) – East Bay is pig latin for Beast! Orange you glad this isn’t an iphone?